Tea is my drink of choice. I have it first thing in the morning, during the day if I’m working from home, and last thing at night with a piece of chocolate (or two). I’m not a tea connoisseur. I just pour near-boiling water over a tea bag dangling in a mug, add some milk and take out the tea bag. That’s it. Tea comes from China and India originally and—something I didn’t know—the tea plant belongs to the camellia family. Today, black tea is a huge export crop also in Sri Lanka, Kenya and Turkey. It’s also grown in western countries, including Australia and the United States, but on a comparatively minor scale. There are many brands of tea on the supermarket shelves. I used to think some expensive brands must be better than others, what with their fancy packaging and—in one brand’s case—appointment to Her Majesty Queen Elizabeth, a strange nod to the distant past and days of the British empire. But lately, I’ve had the sneaking suspicion that all tea bags are the same. The ingredients listed on every box are the same, after all: “black tea”. I know there are different types of leaves, and some black tea tastes vastly different, such as lapsang souchong and Yunnan. However, I’m talking about your ordinary, everyday black tea bags. As I said, I reckoned they were all the same. So I decided to do a tea tasting of five popular brands. And guess what? I’m pleased to say they are all different. No two tasted or looked exactly the same. So my logic was faulty. There is actually no big tea factory somewhere churning out tea bags that then are simply put in differently branded boxes. 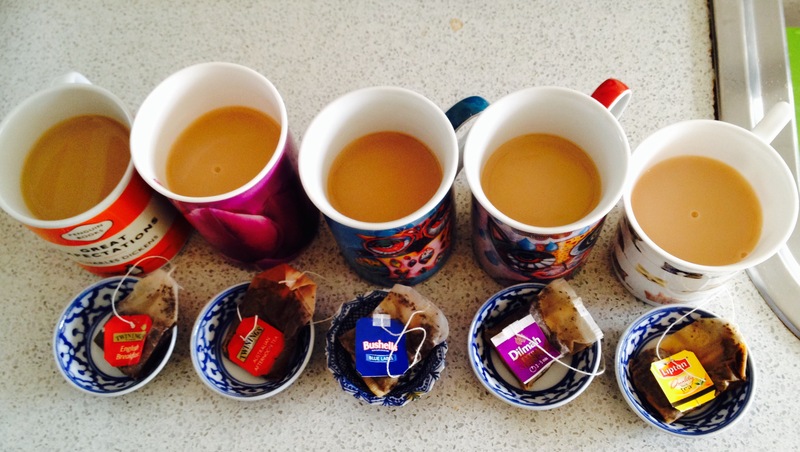 And which tea bag was best? The expensive one or the cheap one? 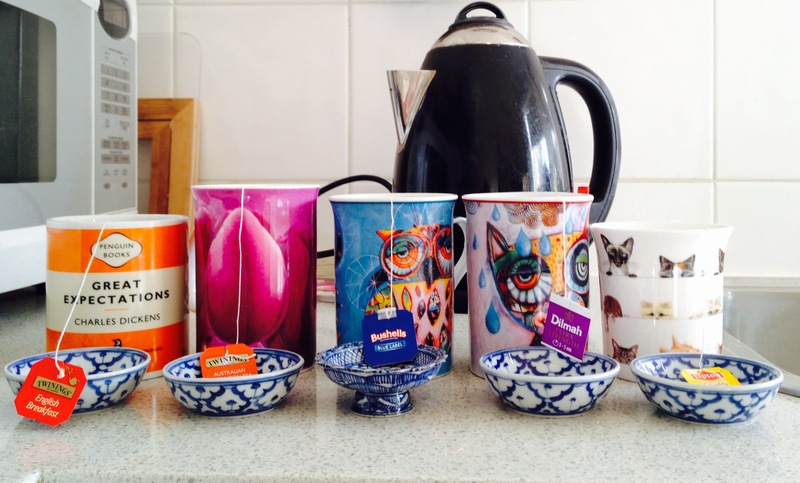 I chose four brands: Twinings (two different types because I buy both English Breakfast and Australian Afternoon Tea and I was suspicious that they might be the same), Bushells Blue Label, Dilmah Extra Strength and Lipton. The prices are based on buying a 100-bag packet (not on special) from Woolworth’s supermarket in Melbourne, Australia, in June, 2015. Mild and smooth, this was my favourite. I love its orange packaging complete with kangaroo silhouettes. But it’s so cute, I was suspicious that it was just the same as English Breakfast in a prettier packet. Not so! Smooth with no trace of bitterness, this was very close to Twinings Australian Afternoon. Unexpected, because it’s half the price. Almost as good as Lipton, but with a trace of bitterness that lost it half a point. I wanted to like this one the most, since I met some of the family who run it at a publicity event once and they seemed so passionate about their product. Dilmah boasts that it is a “single source” Ceylon tea, so that has to be a good thing. It was smooth, and it had a slight sweetness about it that some people might prefer. However, the string connecting the tag was shorter than any of the others, making me think it could annoyingly jump into the cup as you were pouring it (even though it didn’t). This tea was pleasantly peppery, but had a bitter after taste when compared to the others. I was very surprised that this one rated lowest when compared with the rest. 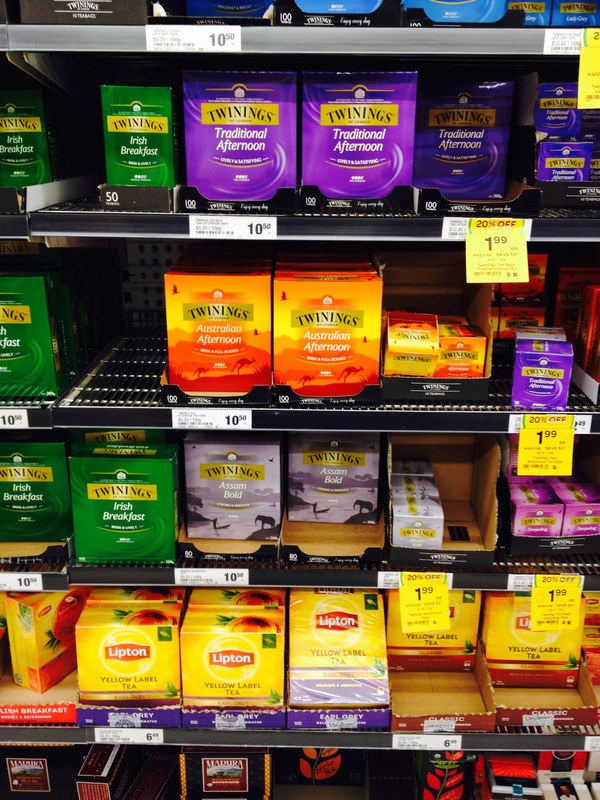 So, on balance, my favourite is Twinings Australian Afternoon, but I’ll only buy it when it’s on special. The rest of the time, I suppose it will be Lipton, which is less than half the price, but has the most ordinary packaging. No matter, I have a tea jar anyway. And how about those tags on the tea bags? This is a whole massive global industry on its own. Lipton bags are stapled to the string (very unglamorous), while Bushells and Dilmah are fixed with miniature stickers, and the string on Twinings is knotted to the tea bag. Are these labour-intensive jobs? Probably, as I’m not sure how they could be done by machine. Another interesting thing about tea, apart from packaging, is the stories that each brand has. I make no judgements regarding these stories, but simply repeat them. Dilmah claims to be “the only global brand owned by tea growers”, run by its founder for 60 years, and says it shares its profits with workers and the Sri Lankan community. Lipton has no family history on its box, but says it is a member of the Rainforest Alliance, ‘helping to support tea growers and the environment’. The company was started in 1890 in the UK by Thomas Lipton, and it used to be a supermarket chain in the UK, also. It’s now owned by Unilever. Bushells started as a tea shop in Queensland, Australia, in 1883. I like the instructions on its boxes: after pouring boiled water on the tea bag, it directs you to “raid the bickie jar” (that’s Australian for “cookie jar”). Then, “wrap both hands around your mug. Fire up a conversation and share the smooth full flavour that generations of Aussies have grown up with”. Twinings of London, of course, is mostly associated with Englishness, which is ironic, since tea isn’t actually English at all. Every packet, even Australian Afternoon, carries the royal crest and the words, “By appointment to Queen Elizabeth II”. Funnily enough, Twinings actually started as a coffee shop, renamed from the original Tom’s Coffee House when it was bought by Thomas Twining in 1706 in London. Apparently, Twinings of London is the world’s oldest company logo (used since 1787). The original shop is still open at 216 The Strand in London, though the company was bought out by Associated British Foods in 1964. 1. Why do cafés charge as much as $5 for a cup of tea (most often just a bag with boiling water), when it can be bought for as little as 1.6c a bag, and that’s retail? Add a spot of milk and about 15 second’s worth of labour and…not $5 worth! 2. Why don’t Bushells and Twinings have apostrophes in their names? This entry was posted in Food & dining and tagged Australian Afternoon, black tea, Bushells, Dilmah, English Breakfast, hot tea, Lipton, tea bag test, Twinings. Bookmark the permalink. I wonder about Question 1 too, Caron! Thanks for sharing your research results. I admit I’m not the daily tea drinker you are. Coffee’s my poison of choice. But still, I do enjoy a good cuppa from time to time. Nice to know that there is a difference and that you don’t have to pay a whole lot to get really good tea. Loved the post! But did you know you’re paying a lot more for your tea simply through choosing the ones with tags? Wonder how your taste buds would have reacted to one of the home-grown brands, such as Nerada or Mandurah? In answer to the café rip-off/mark ups, I guess the argument is that (a) they often use the fancy triangular and boutique tea bags that cost 10x the price and (b) they have to cover staff, rental and other overheads. Plus profit. Hi Jane, and thanks for your comments. Yes, you’re right, I should do an alternative brands tasting as well. I wanted to do the mainstream big-name brands this time, but it would be good to do another tasting. The two brands you mention will be on my list. I’ve had Nerada before and seem to remember I enjoyed it. Re the cafés, yes, sometimes they use those fancy tea bags. But often they don’t! A guy I know who owns a café told me ALL the profit was in tea and coffee, not the food. A frothy cappuccino made by a barista with a swirl of chocolate artfully placed on top, yes I can understand paying a price for it. But a generic tea bag plonked in a cup of hot water should be a lot cheaper. I’m not always at a workplace where I can get a cup of tea easily in a staff room, and I don’t always want the extra calories of a milky coffee. But I hate paying so much for tea, so usually end up with chai latte as an alternative (albeit a calorie-laden one). Yes, I might go back to the loose leaf too, at least for the mornings, when I usually have more than one cup. Loved this post Caron. Brought back wonderful memories of my trip to India. We stayed on a tea plantation for a couple of days and also went to see how tea is made — and got to taste, of course. The tea there is SO delicious. I became addicted to ginger tea — while delicious and very soothing, I found chai a bit too sweet. It seems like forever since I’ve seen a post from you. 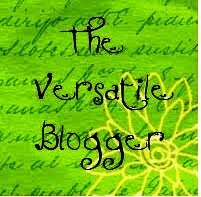 Have you been taking a break or have I not been getting my follower emails? Regardless, I’m glad you’re back! Hi Fransi. How nice that you noticed! Yes, I’ve had a couple of months in which I’ve been working 12 hours a day, seven days a week. Something had to give! I have just a little more time now, so should be back to posting more regularly. I would love to go to India. Ginger tea is beautiful. It’s odd that I like chai, as I don’t have sugar in other tea or coffee. In Australia, we drink it as “chai latte”, so its made with frothy milk like a coffee latte. It’s very soothing when I’m overly busy and have had to talk for five hours. Sorry you’ve had to work so long and hard and glad you now have some breathing room. I am sure you would love India, with and without the tea. Actually the food is also divine, not at all like what passes for Indian food here. Glad you’re back, I enjoy your blog. Thank you! Yes, I love Indian food in all its amazing variety. I had some Indian friends when I lived in Thailand. One ran a restaurant in Bangkok; the other put on a farewell lunch for me at her home with amazing north Indian food that I’d never had before. We have quite good Indian food in Melbourne, but I would love to do a foodie tour of India one day. I think you told me previously that you know a great tour guide, should we be going there. One day! I do and will be happy to give you her info. Even the street food is delicious. Also had wonderful thai and chinese food there. Interesting. I’m not a fan of Lipton tea though. It’s the only tea I add milk to in order to mask the taste. I don’t know many Americans who drink hot tea rather than coffee! Our Lipton in Australia could be quite different, as it’s “packaged in Australia from important ingredients” and Unilever Australasia is an ‘authorised user’ of the trademark. Or maybe it’s the one I’m most used to. That’s really interesting about Irish tea drinkers. Yes, we should get together and complain about the price of tea in cafes. I mean, it’s just boiling water and a tea bag, nothing like what a barista does, and yet tea is often the same price as a fancy coffee. The association of tea with the British stems from the time of the British Raj, the Empire in India. At that time, tea became inextricably linked with the British.